Migrating SharePoint 2007 to SharePoint 2013, or upgrade SharePoint 2007 to SharePoint 2013 is no picnic. When interim patches are not run on your current SharePoint environment, you are not officially supported via the upgrade path provided by Microsoft. Of course, there are other solutions that can successfully deliver a simple SharePoint content migration or SharePoint upgrade. However, if you go with one of these options, you can be sure the value of your content will not improve, and that does not help you make your documents easier to find in the new environment. When you perform a simple one to one migration of content to a new SharePoint environment, you are left with worthless content such as duplicates, or content lacking good metadata. Would you like to fully utilize your new SharePoint 2013 environment? If so, you first need to improve the quality of the content during the migration. Once you clean the content properly, then you can associate it to a new uniform data structure and metadata model. 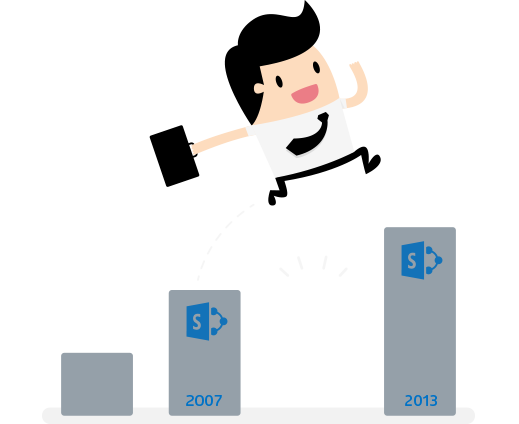 Want to know what we can do for your SharePoint 2007 to SharePoint 2013 content migration? Please contact us or request a quote.